I Checked and Reviewed ScoopFree Ultra Self-Cleaning Litter Box for You! What do you get with the litter box? How ScoopFree Ultra Self-Cleaning Litter Box Works? How to increase the lifespan of the litter trays? How to acclimate your cat to the ScoopFree Litter Box? ScoopFree Ultra self-cleaning litter box is one of the most popular automated cat litter box these days. It has gained the reputation of one of the bestselling products on Amazon. ScoopFree automatic litter box has disposable litter trays which use blue crystal litters. This litter is great for absorbing urine as well as controlling the odor. 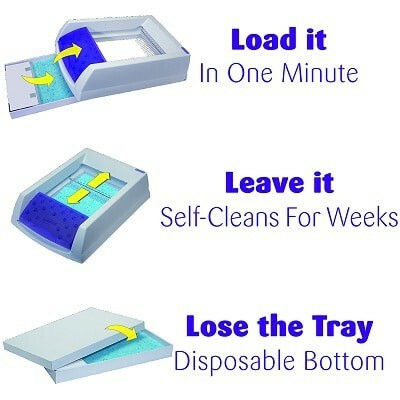 The disposable tray is what makes this litter box automatic and free from the hassle of cleaning. The disposable litter tray is used as the bottom unit of the litter box. So, when cats do their business and eventually the tray gets dirty enough, all you need to do is throw the tray away and use a new one. It’s that simple! ScoopFree recommends that you should change the litter tray every 20 to 30 days if you have one cat. For 2 cats, the time span is 10 to 20 days and for 3 cats, the time span is 7 to 10 days. However, if you have more than 2 cats, it is better to get a second unit of ScoopFree ultra self-cleaning litter box. ScoopFree ultra litter box has an automatic rack system which cleans the litter by pushing away the waste into a covered compartment. The rack can be programmed to perform this operation after 5, 10 or 20 minutes from your cat doing her job. If in the meantime your cat enters the litter box again, the timer will reset and start from 0. The waste compartment is located at the front of the litter tray. ScoopFree original self-cleaning litter box uses the crystal litter which absorbs liquid waste very quickly and makes solid waste dry out. After 20 minutes of the cat doing her business, the automatic rake system of the litter box pushes away the dry solid waste into the waste compartment located at the front of the disposable tray. The timer will restart if your cat re-enters the litter box. The crystal litter absorbs pee in a jaw-dropping speed in the waterproof tray. You’ll have to replace the disposable litter tray after every 1 months. ScoopFree Ultra has a hood to give your cat the privacy she needs to do her job properly. It also helps to properly contaminate the waste inside the litter box. Unlike the original version, you can reprogram the automatic rake system to start pushing away the waste into the waste compartment after 5, 10 or 20 minutes of your cat doing her job. It also comes with a health counter monitor which keeps count of how many times your cat has used the litter box. It comes in very handy when you are checking your cat’s health. From start to finish, the whole process is automatic. You don’t have to go through the hassle of cleaning out the litter box every single day. All you need to do is throw out the disposable litter tray once a month. 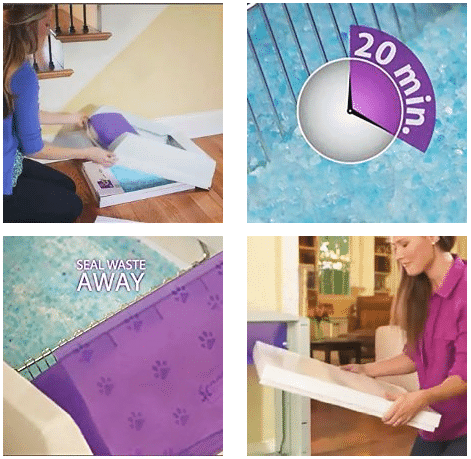 This litter box uses blue crystal litter which has super absorb co-efficient. The litter is also dust-free. A recent study showed that crystals can absorb liquid many times faster than a traditional litter. Thus, the blue crystal quickly absorbs cat’s pee and controls the odor. The automatic raking system is highly reliable and programmable. ScoopFree Ultra Safe-cleaning litter box has three advantages over the original version: it has a hood included with it, programmable raking system along with a health counter. This self-cleaning litter box uses disposable litter trays that are filled with high absorbing blue crystal litter. This crystal litter offers superior absorption of pee and odor control of feces. All you need to do is replace the old litter tray with a new one every month. Nothing more is necessary. The litter box runs on 120V 60Hz AC power supply. It comes with a 10 Ft. long cord. The litter box comes in two colors: purple and taupe. 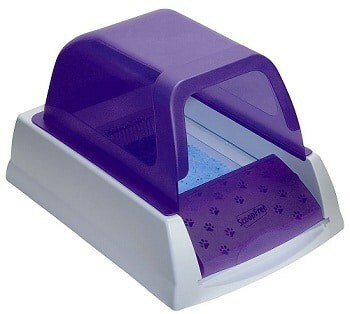 You can get the disposable litter tray either in Lavender scent, original scent or dye free. With ScoopFree Ultra self-cleaning litter box, you’ll enjoy a 90-day full money back guarantee. So, you don’t need to worry about wasting your money. If you don’t like the litter, you can simply return it. There is no shipping cost at all. 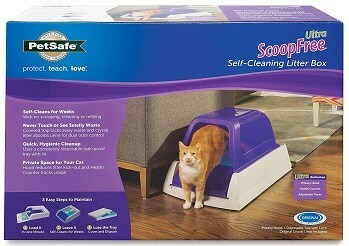 ScoopFree offers a 1-year limited warranty with their litter box. Litter box size: 19-1/8” W x 27-5/8” L x 6-3/8” H. the height becomes 16” when you install the optional hood. Runs on 120V AC adapter. The litter box weighs 19.55 pounds. Suppose your cat enters the litter box and pees on it. Now, the high absorbent blue crystal litter will absorb the liquid very fast. Depending on the program, after 5, 10 or 20 minutes of your cat doing her job, the automatic raking system will run through the crystal and re-distribute it flatly on the litter tray. As the crystal litter absorbs the liquid waste, no clumps are formed and stored in the waste compartment of the litter box. When your cat poops on the litter box, the automatically programmable rake will collect the clump and push it to the waste compartment of the litter box. The waste compartment will open its door, collect the clump and close the door as soon as the rake returns to the first position. The waste trap cover and the waste trap itself are attached with a magnet. They work as a whole unit in the litter box. Thus, they open and close at the same time to receive and contain waste clumps. The trap cover helps to control the odor so, your room remains fresh and healthy. ScoopFree has premium quality rakes on their litter boxes. These rakes don’t get jammed or stuck like other companies self-cleaning litter boxes. These automated rakes change the direction as it continues to swap back and forth within the litter box. The rake moves in a highly calculated scientific manner to re-distribute as much litter as possible on the litter tray and push as much clump as possible to the waste compartment. The crystal litter works best when the atmosphere is dry and there is less to no humidity in the air. With high amount of humidity, the crystals tend to lose their effectivity. Inserting a new litter tray and replacing the old one is very easy and straightforward. All you need to do is place the litter box against a wall, slide the plastic to get rid of the old litter tray, then slide in the new litter tray to the litter box and close the plastic over. Now, pour fresh crystals over it. After that, take the old litter tray, put it in an enclosed bag and throw away to the dustbin. The first thing you need to do is place the litter box in a place where there is less to none humidity in the air. Humidity is the number one enemy of crystal litter. As the crystal litter controls the odor by absorbing humid waste, extra humidity on the air will interfere with its operation and thus, reduce the litter’s lifespan. So, don’t place the litter box in places like the bathroom, near the shower place or in the basement. What I would like to do is, place the litter box in a place that has high air circulation. it ensures that humidity is pushed away from the room. Some cats have the habit of urinating on the same spot over and over again. It creates more saturated crystal in one place which is not preferable. So, if your cat has this kind of habit, it is better to occasionally stir the crystal litter to make it less saturated in one place. If your cat has a high amount of crude fiber and ash on her diet, she’ll produce more solid waste. So, the waste compartment may get filled quicker than you think. That’s why it is better to keep your cat’s diet free from fillers or by-products as much as possible. It is a good idea to place your ScoopFree self-cleaning litter box beside the old litter box your cat was already using for the first week. Thus, your cat can go to either one of the litter boxes. It will also help her to use the new litter box. If your cat is not using the new litter box, take some unused old litter from the previous litter box and pour it on the new litter box. You can also add some crystal litter from the new litter box to the old one. It will help your cat to get adjusted with crystal litter. Don’t clean the old litter box. Cats tend to like clean litter box. As the old one will get dirtier with time, your cat will find the new litter box more appealing. Once you see your cat is using the new ScoopFree litter box without any problem, take away the old litter box immediately. If you have a kitten less than half a year old, then it is better to leave the ScoopFree litter box unplugged and scoop over the litter manually until they cross the six-month age threshold. This way prevents any risk of danger. The ScoopFree ultra self-cleaning litter box is very easy and straightforward to use. You don’t have to think about changing the litter box at all. All you need to do is replace the cat litter tray once every month. It takes off the weight of cleaning litter box every day from my shoulder. It also lets me to spend more quality time with my cat. The rake is programmable and equipped with a sensor. It detects when your cat leaves the litter box after doing her job. 5, 10 or 20 minutes after the cat leaving the litter box (Depending on what settings you used), the rake starts to move and re-distribute the litter as flat as possible. Crystal litter is 5 times more effective at absorbing liquid waste and controlling the odor of the feces. It also dehydrates the solid waste and turns these into dry clumps which helps the rake to push it over to the waste compartment. The waste compartment has a plastic lid over it, so it contaminates the solid waste and controls the odor. It works in synchronization with the automatic rake system. Every process is automated. You don’t need to lift a finger. The cleanup process is very hygienic and takes little to no time. All you have to do is, take out the old litter tray once a month, put a cover on it and throw it out at the dustbin. It may only take you 5-10 minutes. Don’t forget to put a new litter tray in the box. You have to continue on buying additional litter trays for this litter box. It may get quite expensive if you have more than one cats. If your cat loves to dig, it might block the sensor with piles of clump. Also, excessive digging may leave a scratch mark on the bottom of the litter box. Occasional stirring of the litter may be required if your cat does her job on only one side of the litter box. The area of the litter box is not great for large size cats. With some cats, you may find it harder to shift them to crystal litter. If the weather is constantly humid where you live, this litter box might not be a great product for you. One of the big limitations of using the ScoopFree Ultra self-cleaning litter box is, you need to continue on buying disposable litter tray for the rest of your life. For a single cat, it might not be that big of a deal. But if you have more than one cats, the process may get quite out of your price range. So, here I am giving two alternatives to using disposable litter trays in ScoopFree self-cleaning litter box. However, keep in mind that these alternatives will not work as effectively as the disposable litter tray. The crystal litter is made of silica which is a must for using in ScoopFree self-cleaning litter box. Check that if the crystal litter is in the right size for the forever tray. If you mess up those 2 things, this alternative won’t work. If your crystal litter size is too big, they will be dragged into by the rake and it will create a mess. On the other hand, if the size is too small, the crystal may get into the motor and malfunction it. So, try to get the exact size crystal that came with the litter box. Cleaning the forever litter tray takes a little bit of time. You need to get rid of the dirty litter, clean the tray with a hosepipe and make it completely dry off before adding new litter. If there is even a little bit of moisture left on the tray, the crystal will absorb it and get ruined. Here is a good deal of forever litter tray that I have found on Amazon. 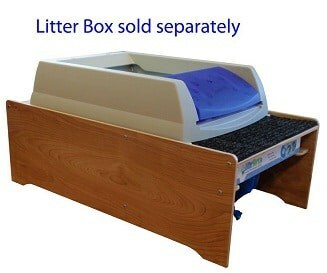 The litter bagger system is an effective yet costly alternative of using disposable litter trays. This system has a wooden platform with a hole in the middle. A bag is attached below the hole of the wooden platform. The way this system works is this: when the automatic raking system goes through the liter, the clumps fall into the bag rather than getting stored in the waste compartment. It has its own permanent litter tray. When you feel that it is time to change the litter, just scoop off the wet litter into the bag and refill the tray with new crystal litter. Take off the waste-filled bag and toss it into the dustbin. 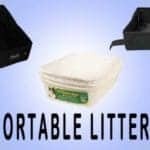 Check out the latest price of Litter bagger system here on Amazon. I know that ScoopFree Ultra Self-cleaning litter box can be a little pricey especially if you have more than one cats. But the thing is, you get what you pay for. 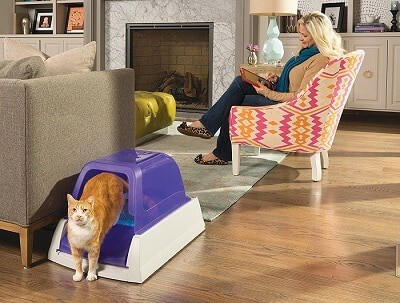 It is a high-quality programmable self-cleaning litter box that completely relieves you from the daily monotonous job of cleaning the litter box and scooping out clumps. This litter box is programmed to take care of everything. All you have to do is change the litter tray once a month. I have personally found this litter box much more time-saving and weight-lifting. It saves a great deal of my time which I can spend with my furry friends. So, if budget is not an issue and you want something of good quality for your cat, then I’ll definitely recommend ScoopFree Ultra Self-cleaning litter box to you. Surely, it has some flaws. But, let’s face it, the features of this litter box outweighs the flaws hundred times over! Can I continue to reuse the litter tray and only change the litter? It’s not a good idea. The litter tray is disposable so, if you use it for more than a month, it may start to leak and get messy. Excessive use can break down the tray too. Can I use ScoopFree for multiple cats? One litter box can be used for 2 average sized cats maximum. Other than, the litter tray needs to be changed every 7 to 10 days which is not economically probable. 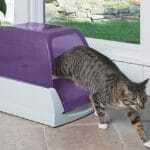 Litter box size: 19-1/8” W x 27-5/8” L x 6-3/8” H. the height becomes 16” when you install the optional hood. The dimension of the litter tray is 22” x 14-1/2” x 2-1/2”. Size of the litter bed is 14” W x 15-1/2” L. Litter area is 14 by 14 square inches. How to change the litter tray? If you have one cat, you need to change the litter once a month. All you have to do is slide the plastic upwards, take out the old litter tray and replace it with a new litter tray. Then slide the plastic back in its place. after that, cover the old litter tray and throw it out to the dustbin. How to extend the lifespan of litter tray? Please have a look at the article. I have dedicated a whole section of my article on this topic particularly. Is it hard to set up the litter box? Absolutely not. All you ever need to do is slide in the litter tray, fill it with blue crystal litter, program the automatic raking system for a desired time interval and plug in the AC adapter. The whole process may take roughly 10 minutes. How often should I change litter tray? For one cat- once every month, two cats- once every 20 to 30 days and for more than two cats- once every 7 to 10 days. The manufacturer company has tested this litter box 100,000 times in the LAB. The litter box passed every time with flying colors. What are the safety precautions of using the ScoopFree litter box? Not recommended for cats who have a problem with using the litter box in general. Keep away from small children playing near the litter box. Pregnant person should keep a distance from the litter box. Keep the litter box away from all kind of wet and high humidity place. Once every week check if the litter box is working well and the indicator is green or not. 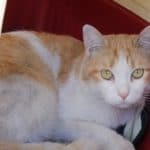 What will happen if my cat re-enters the litter box before the rake starts to sweep? if your cat re-enters the litter box before the rake starts sweeping, it will activate the sensor and the timer of the rake will reset to 0. So, when your cat leaves the litter box, the timer will start from 0 again. How to get a replacement of ScoopFree litter trays? I recommend getting them from Amazon. Amazon has a very reasonable price. Click here to check out the current price. Why is the greed indicator flashing? Rapid flashes indicate that the cat is in the litter box and it is blocking the sensor. If the indicator is flashing rapidly and your cat isn’t in the litter box, then it indicates that urine or other waste are blocking the sensor. Slow flashes indicate that the countdown mode is ON and the rake will start to sweep after 5, 10 or 20 minutes. Once the rake completes sweeping, the indicator should turn back to steady green.